Greek vase painters often depicted narratives by showing a chosen moment from an episode of great importance to a story or myth. These favorite episodes became formulaic representations of myths, some serving as parables for contemporary events. The figures could be identified by the attributes, symbols, or objects that surrounded them. The work of the so-called Rycroft Painter, first identified in the Rycroft Collection in England, is characterized by extremely fine draftsmanship, especially in the rendering of equine anatomy. Chariot scenes and depictions of the wine god Dionysos were among his favorite subjects. One side of this beautifully preserved black-figured vase shows Hermes, the messenger god, squiring Leto, mother of the twin deities Apollo and Artemis, to the august company of the Olympian gods. Leto appears mounting a chariot with her adult children. On the other side Dionysos wears a crown of vine leaves and raises his drinking cup. He is flanked by dancing maenads who play krotala (similar to castanets) and by lustful satyrs. 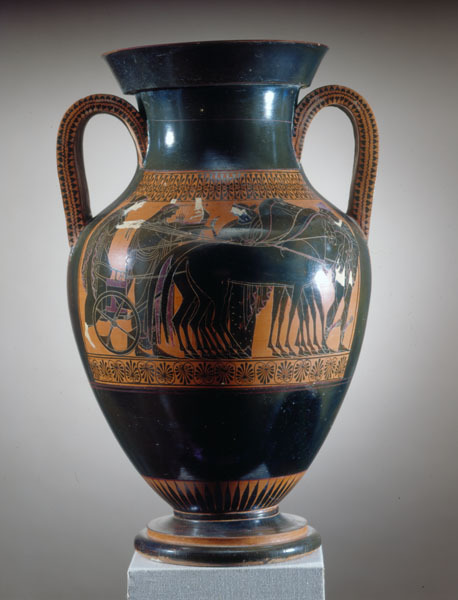 Since the amphora was frequently used as a container for wine, the imagery of Dionysos is particularly appropriate.